Bellevue Lifespring refreshes its longstanding thrift store. Bellevue Lifespring introduces its new-look Thrift Culture shop in Bellevue Square. Summer, we hardly knew you. After a late arrival, sun soaked vacation days are dwindling and it’ll soon be time to pack lunches and ship the kids off to school. On the bright side, the oncoming of autumn gives us an excuse to go shopping—back-to-school shopping that is. After hosting barbeques, going on family trips and sipping wine on the patio, your wallet deserves a vacation of its own. Enter the recently reopened thrift shop and nonprofit organization Bellevue LifeSpring, now on the third level of Bellevue Square. 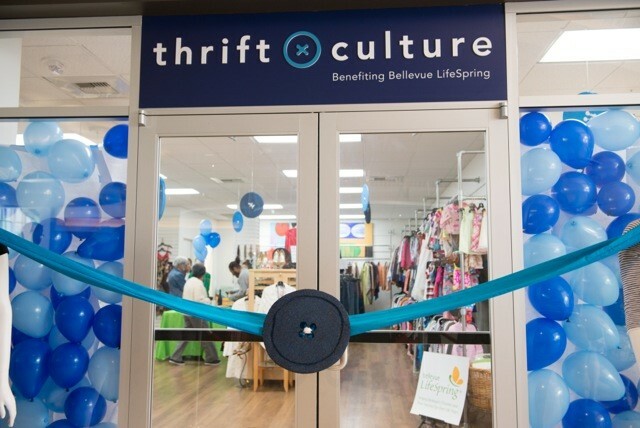 Just in time for National Thrift Shop Day (Aug. 17), the store’s new location is rebranded as “Thrift Culture,” where profits fund the organization’s programs supporting local children living in poverty. Bellevue Lifespring provides vouchers to low-income families so they can purchase school and work necessities at its Thrift Culture store. Thanks to the generosity and support of the Kemper Development Company (LifeSpring is only charged $1/year to rent on the property), the organization has operated for more than 70 years, making it the longest-standing merchant at Bellevue Square. So skip the usual destinations for back-to-school shopping this year, and discover unique, one-of-a-kind items while also shopping for a good cause. And don’t forget to bring a donation! Women’s tops, designer handbags and children’s clothing are most-needed.